Snowdrop is not easily confused with other wild plants on this web site. 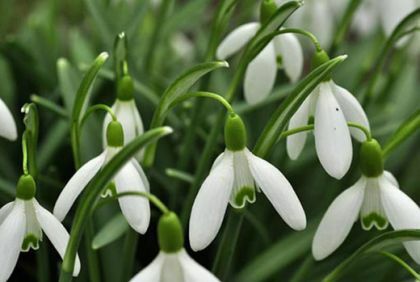 One of the first flowers to dare to show its head in January and February, the Snowdrop is one of our best known spring bulbs. A low-growing perennial which is found growing beside streams, on roadsides and in damp woods, this plant is a garden escape which has naturalised in the eastern side of the country. The familiar little flowers have three white outer 'petals' (15-25mm long) - in reality these are sepals - and three white inner petals, each of these having a cleft with a green patch around it. These sweet-scented flowers are borne, solitarily, on leafless stems, nodding below a terminal bract. There are two or three blue-green narrow linear leaves to each bulb. This plant belongs to the family Liliaceae. 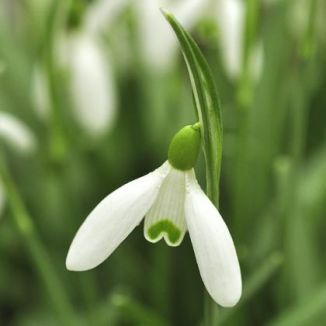 The Latin genus name – Galanthus comes from the Greek - gala meaning milk and anthos meaning flower.